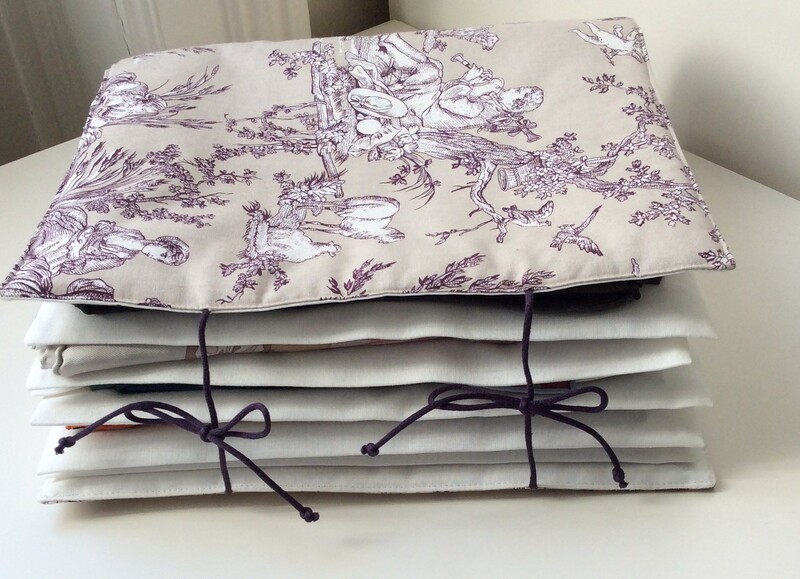 Today I want to show you how I store my scarves and what I use when I take them with me on trips. 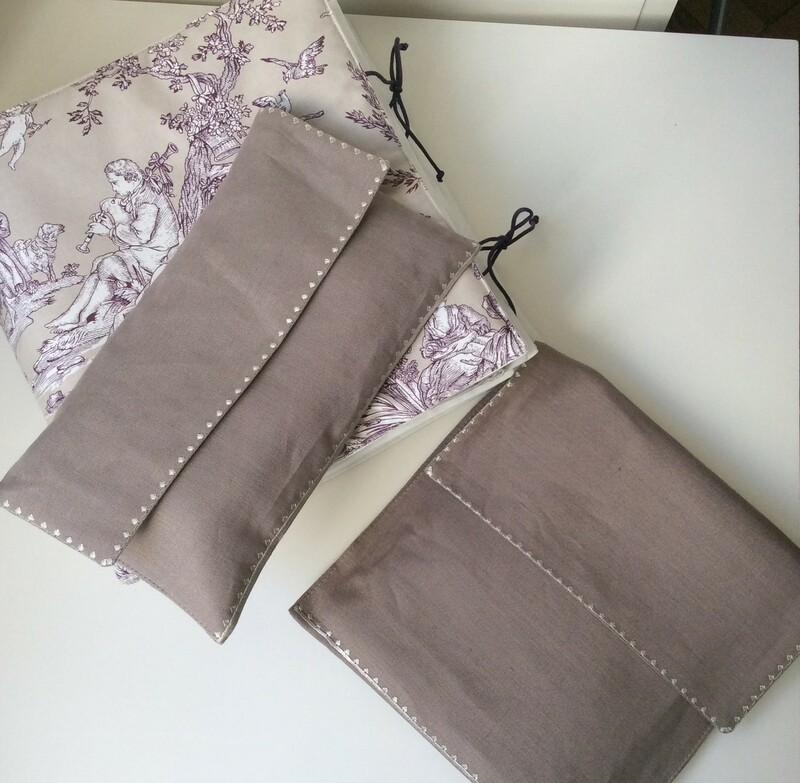 The “pochettes” are linen or cotton pouches for silk scarves. Here you see the three pochettes that hold almost my entire collection. 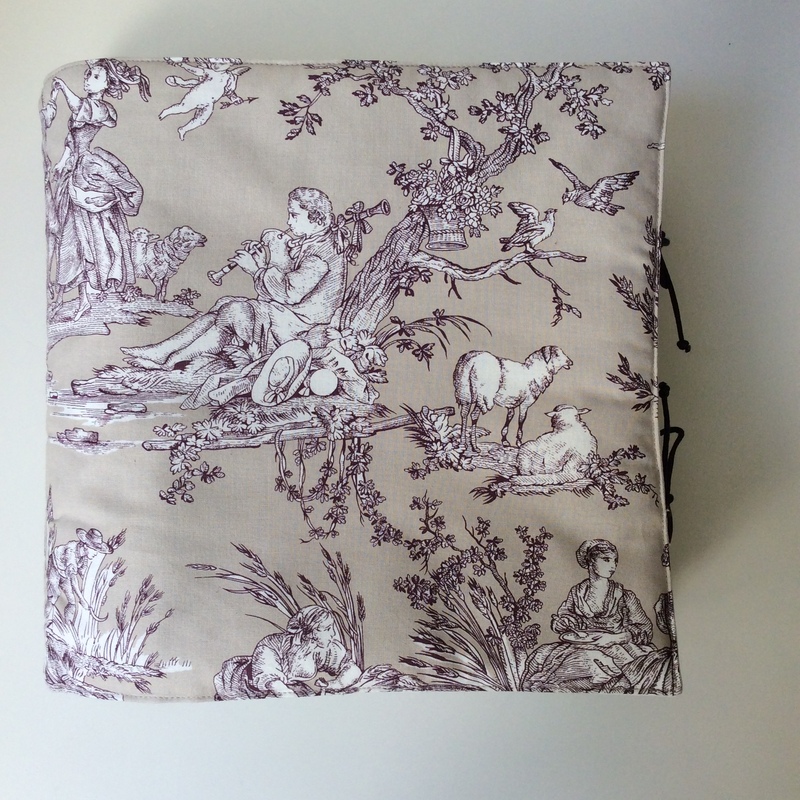 Above is the Toile de Jouy scarf travel pochette. It can be used for travel or just to keep your scarves safe at home, it saves a lot of space too. The inside with Phoenix Mythiques peeking out. 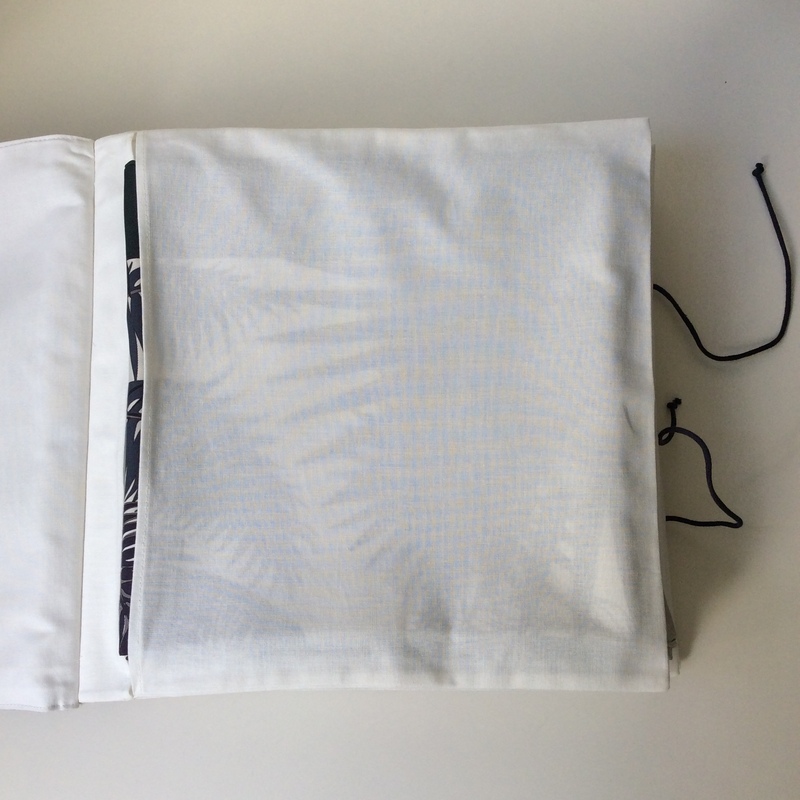 There are six “pages” where scarves can be inserted, you can also put scarves in between, taking the capacity up to ten. The bigger of the two is the shawl pochette, it does the same for your large sized H goodies, shawls or GM silks. Inside is an additional zipper pocket for smaller scarves and small compartments to put in your scarf rings – genius! The two filled with 45 and 70 silk scarves and my pareo, respectively. I used to use them for travel only, but the other day, I felt compelled to visually clean up my scarf drawer and put them all into the pochettes, where they are nicely tidied away. This is my H silk drawer with the pochettes in place. Shawls, GM silks and my red mousseline stay “unpacked”. I hope you enjoyed this peek into Scarfland today. How do you store your scarves? This entry was posted in Hermès, Scarf Collection, Scarves and tagged accessories, Hermes, MaiTai Collection, scarves, Silk scarves, Storage, Travel. Bookmark the permalink. Thank you for sharing this with us (and for another Hermès post, I always enjoy them so). I thought about you (and your post on the limited edition 24 Faubourg bottles), as it is the first week of sales in France and it took about 30 seconds to the sales lady at Printemps to lure me into buying a 40% off special edition of Terre d’Hermès. Coming back to scarves, I am keeping my carrés (which are few and all 90) either in their boxes or in silk paper (for those bought at the ventes exceptionnelles). 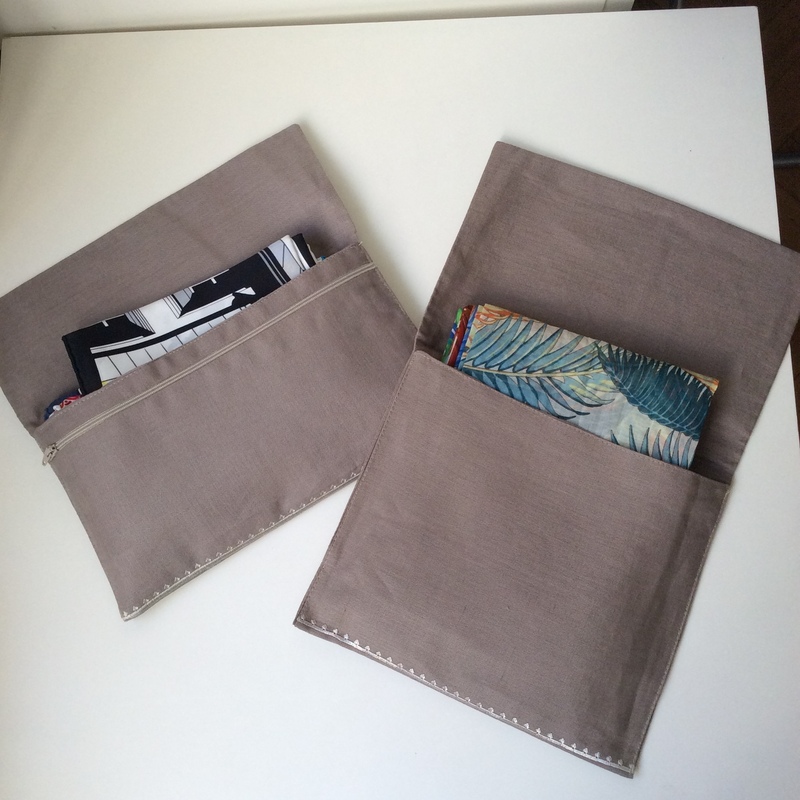 Happy to hear that MaiTai’s pochettes work so well – the travel pochette was aleady on my list. Have a great w-e! Congratulations on your new Terre d’Hermès! A great deal! 🙂 I store my Hermès scarves in various boxes – those that are not my present favorites go into orange boxes and those I wear frequently are stored in a large sturdy vintage Louis Vuitton box, where I can just grab them when on the run. Think no more! 🙂 I really find them very practical. Since you travel a lot, you would get your money’s worth, I think. Who would have thought that storage solutions could be so stylish? Those Mai-Tai pochettes are gorgeous as well as practical. Very impressed that you have even stored away your scarves within your drawer. That Kondo book really worked – too bad I’m too scared to read it! OMG! I just read the Kondo book too. Obviously she’s mental and I’m ignoring it completely. As to scarves. Seriously, I’m coming to your house and messing that whole lot up just to give you the joy of re-arranging it again. Excellent! I will prpbably not do it but one of the things I LOVE to do is run into Kath’s room and muss up her bed. She loves it and laughs but I think she hates it too. Most of my scarves are of the heavy winter variety so I’m not too savvy with the silk type. What about crease? Are creases from folding them okay or do you ever iron them? The silk of Hermès scarves is so smooth, that creases from folding usually disappear within an hour of wearing, the same goes for creases from knots. After wearing I just let it lie flat for some time and they bounce back to their natural smoothness. I have hand-washed and ironed older ones though, and they look as good as new after that too. Wow – the pochettes are things of beauty in their own right, as well as practical! I love those pochettes. My scarves are just folded in a drawer. I need some of the pochettes for travel. Thanks so much for posting this! Go for it, they are really a great investment. Those pochettes are lovely. I have a lot of silk left from various projects and might make my own…. Great idea! Let me know if you do it and how they turn out! I have a similar pochette that I use for my Hermes scarves when traveling. At home I keep them in their boxes, with the name of the scarf on the side of the lid so it is always visible when the boxes are stacked. I use my label maker because my handwriting isn’t the best! As I said on the MQ post, you are admirably organized! You should see my office…looks like a bomb went off. LOL. At home I store my carres and Gavroches in their boxes (sometimes up to three in a box! 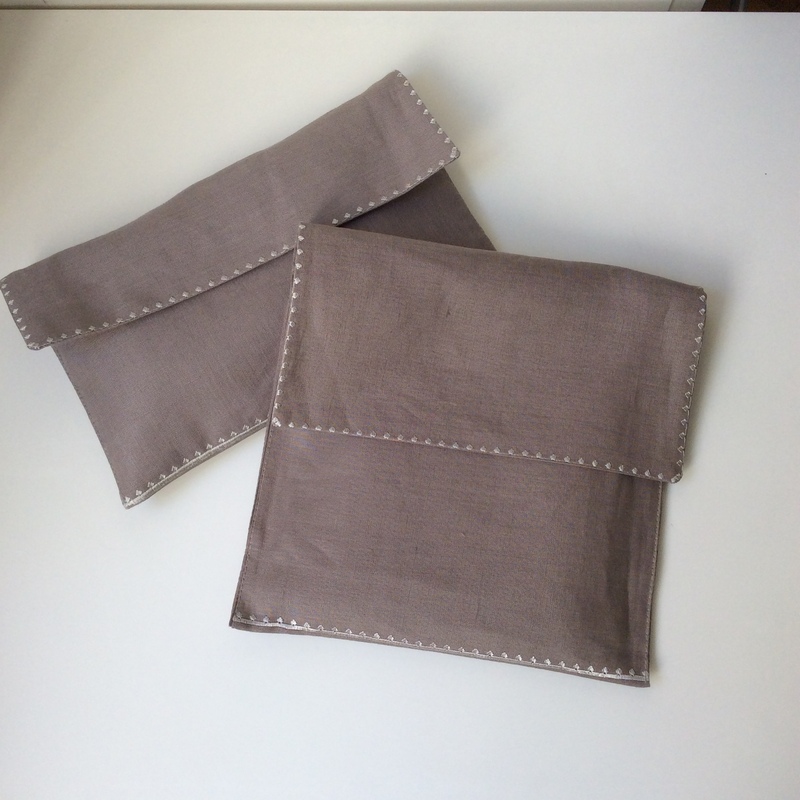 ), but when travelling I use MaiTai’s fabulous pochettes. Glad you like them too, Preska!